Yes -- a book about the songwriting partnership, and the songs. Author Ian Shircore has just completed this splendid tribute to the canon and its creators, and publication is due in October, in hardback and e-book formats. Clive and Pete have both been consulted during its gestation, and are reportedly very pleased with the way it looks. 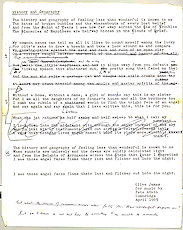 Ian himself is a long-time fan (though not at present a Voice), his love of the songs dating from Pete's first appearance at the Hanging Lamp Folk Club in Richmond, which Ian helped run from 1968 through the early 70s. He'll be the first to admit that the work is hagiographic, but the way each of its 26 chapters lightly weaves its way through accounts of what might at first seem unrelated artistic endeavours, to finally focus on a particular song from the canon, sometimes picking out references from the lyric, sometimes demonstrating how perfectly it is set, excuses the veneration. And you'll learn something new with every page: Leonardo (da V), Elvises C and P, John Donne, Irving Berlin, Johnny Mercer, Andrew Lloyd Webber, Keats, Shakespeare, Smokey Robinson, Bruce Springsteen, Chip Taylor, The Beatles and more -- all help illuminate the story. It's a cliché that a successful popular science book shouldn't include a single formula, equation or Greek letter. In this book about songs, Ian has likewise avoided the inclusion of any musical notation, though he writes knowledgeably about tempi, modes, harmony and modulation. 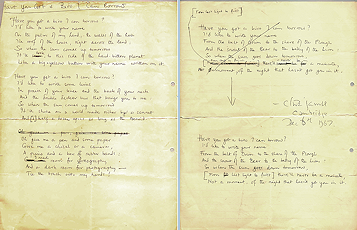 Lyrics are quoted extensively, many in their entirety, and he includes images of some original lyric sheets, as submitted by Clive to Pete during the songwriting process. A late decision was made to include photos as well. Pete and I have helped with a number of shots, but Ian would very much like to have a picture of the two of them on stage during the Australia/Hong Kong leg of the 2003 'World Tour'. I know there were a handful of Voices at the Sydney show, including myself, but I don't believe any of our number snuck a usable shot past the usherette camera-spotting police on that night. Does anyone here have, or know of, a good photograph of our heroes together on stage during that tour? Please reply to this post or message me if you can help. This book should be a huge advance in the public recognition of the body of work that brings us together here on MV. We look forward to seeing it in print, come October. Consider it pre-ordered, soon to winging its way to the States. 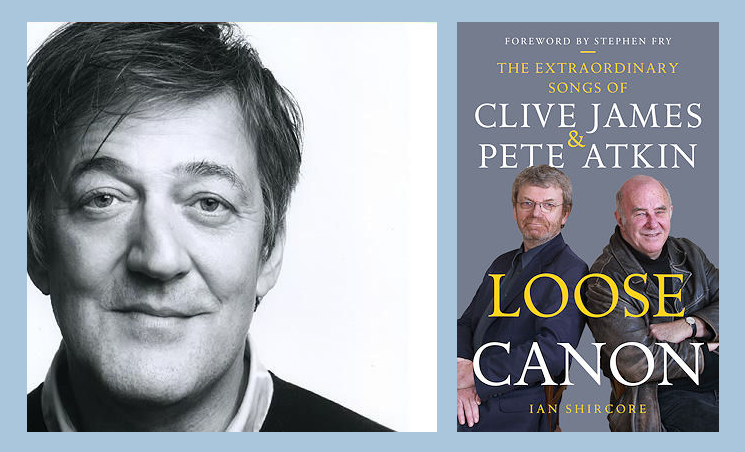 Loose Canon: The Extraordinary Songs of Clive James and Pete Atkin. Looking forward indeed! A very exciting prospect, announced right out of the blue. Presumably this was a very well kept secret until now. Great news, many thanks to you Steve for this. I too have pre-ordered, and eagerly await it. I was a regular at the Hanging Lamp from the late 60s till the mid 70s, and saw Pete there on his first and second appearances, having already been aware of him and owning the first albums. It was a quirky little club, with many great performances, by artists like Al Stewart, John Martyn, Magna Carta, Strawbs, Mike Maran and a number of very talented floor artists, who played the first sets. It was in the crypt of a church, unlicenced, and the walls were always dripping with condensation and sweat. It would never get a licence these days. Exciting. A little more from the publishers on their site though the pre-order link didn't quite go to the right book though it was from another Cambridge student. Thanks Cary. I alerted Ian and he's had them fix the bad link. Stephen Fry contributes foreword to "Loose Canon"
Ian Shircore, author of Loose Canon, has negotiated with his publisher Red Door a special discount and pre-publication delivery offer on a signed (by Ian) copy of the new book, exclusively to members of Midnight Voices or of the closed Facebook group "The Pete Atkin and Clive James Appreciation Society". The offer price is £15, fully inclusive (including Worldwide delivery). To take advantage of this special deal, send an e-mail to the offer address as directed here. Please note you must be logged in to MV in order to follow this link. Forgotten your log-in? E-mail me at . MV Member Andrew Curry gives a comprehensive review of the book in his excellent blog Around the Edges. 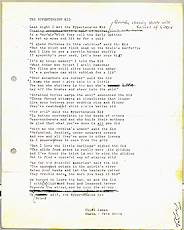 When you've read it, check out the links at the foot of the blog page, to earlier entries concerning the songs.